when we are dirty and broken, that we get back up and run like hell . 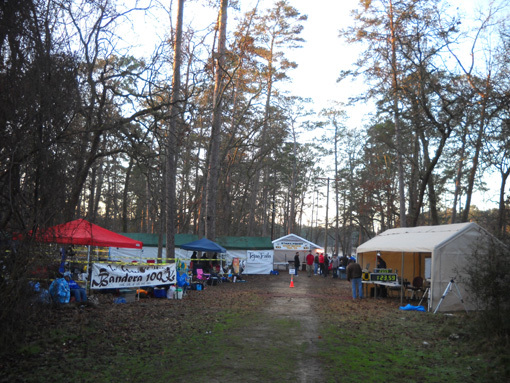 . ."
This is the second Tejas Trails event for which we've volunteered this year; the first was Bandera. Since we didn't get volunteer shirts at Bandera we asked for them this time so runners could identify us as volunteers when we were working. 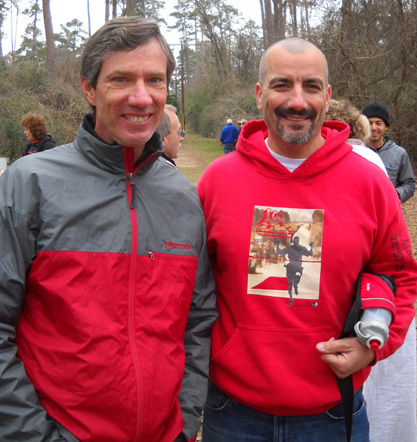 The shirts don't have dates or race names; we can use them at other Tejas Trails races for which we volunteer. 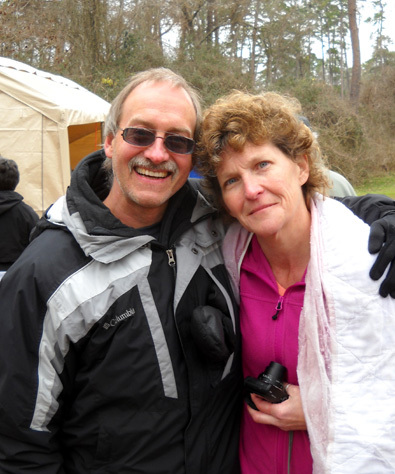 RDs Joe and Joyce Prusaitis put on eight or more trail events throughout the year in Texas. 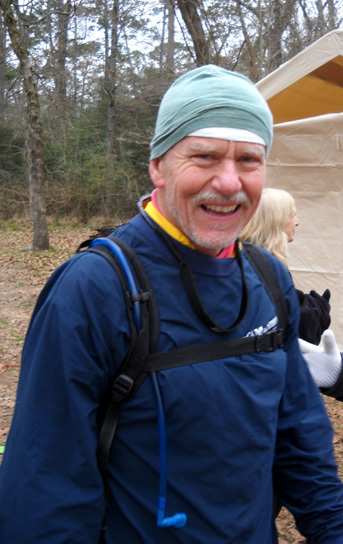 Jim had intended to run the Rocky 50-miler but because of his plantar faciitis injury and our frenetic schedule in January he was unable to train adequately for the distance. 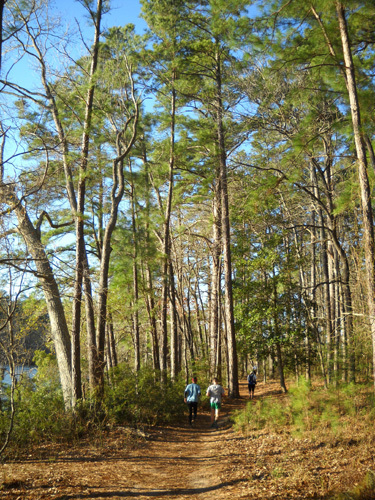 Rocky runners enjoy a beautiful day along Lake Raven. Fortunately for us, this is one of those ultras that doesn't have a deadline to enter and it didn't reach its park-imposed max of 750 runners. It came close, though, with about 700 entrants. Jim could wait until a few days before the race to decide whether he'd run it or not. I had already gotten on the volunteer list; when Jim knew he wouldn't be running, he contacted Joe about volunteering, too. We figured we might as well work the race since we knew lots of the runners and we were on-scene. 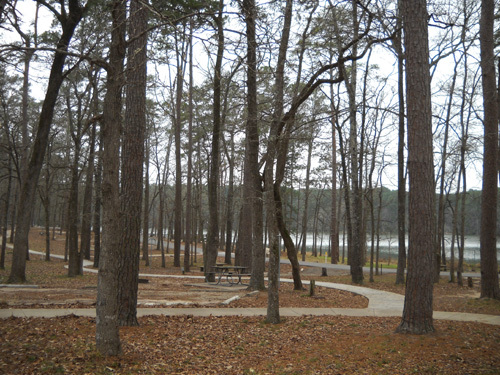 We have been camping at Huntsville State Park, site of the Rocky races, since January 25. We lucked out the day we arrived and got our favorite camp site in Prairie Branch Campground (below). It's a little over half a mile to the start/finish of the race, which is very convenient on race day whether we're running the race, crewing, pacing, or volunteering. On race weekend we made that hike back and forth quite a few times! The parking lot near the start/finish (lodge area) was too crowded to even consider driving up there. 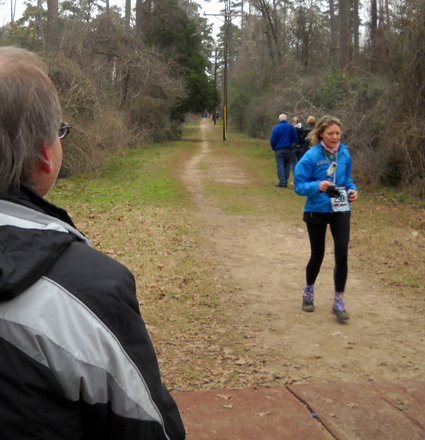 This was the 18th year for the Rocky Raccoon 100-mile race. I think it has grown every year since its inception. 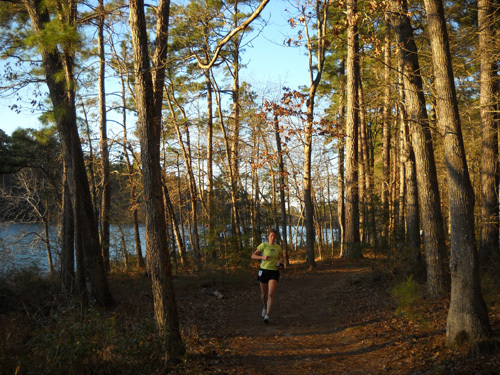 Because of its undulating terrain, relatively smooth dirt trails, low altitude, and usually mild weather (considering it's early February), it's popular with 100-mile newbies, runners who want to set a PR, and folks who are just plain sick and tired of snow at more northerly latitudes. There aren't a lot of early February ultras where you can run sleeveless! This year runners would enjoy sunshine and warmth during the day Saturday but high humidity and temps in the low 30s on Saturday night played havoc with many runners' plans for a fast time -- or even a finish. Hypothermia became a big problem as many runners slowed to a walk during the night and were unable to maintain adequate body heat. Although more runners than ever began the 100-miler, the finish rate of 68% was the lowest in the race's 18-year history. The time limit was 30 hours, which is common for this type of terrain. The 50-milers had it easier. They weren't out there nearly as long and they didn't have to endure the cold, damp night if they finished in twelve hours or less (they had up to 29 hours, plenty of time to walk the whole thing). Their finish rate was 84%. 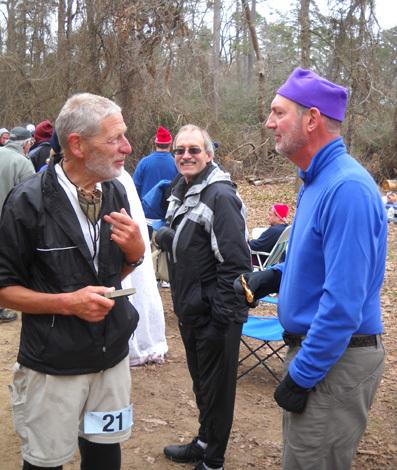 Jim and I had some concerns about volunteering in another huge Tejas Trails race again so soon after Bandera. We had ambivalent feelings after Bandera because of the large number of runners coming through our aid station multiple times and the long, long day and night we worked. 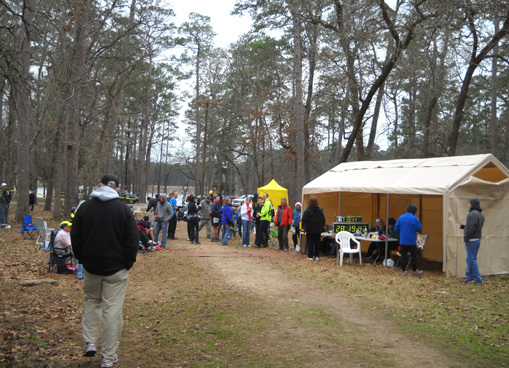 Dogwood (start/finish/turnaround) aid station on Saturday morning. We knew there would be even more runners at Rocky. This time we were more clear about where we wanted to work, what we wanted to do, and for how long. At our age we can handle four to six hours at a time better than ten to twelve. We also aren't fond of working during the night. We thought about the jobs we've liked the best over the last thirty years of volunteering -- registration, packets, and direct contact with the runners during the race -- and some of those are the ones we volunteered for at Rocky this time. One of our choices was packet pick-up, which was held for the first time at the large veterans' building (also a storm shelter) in north Huntsville. 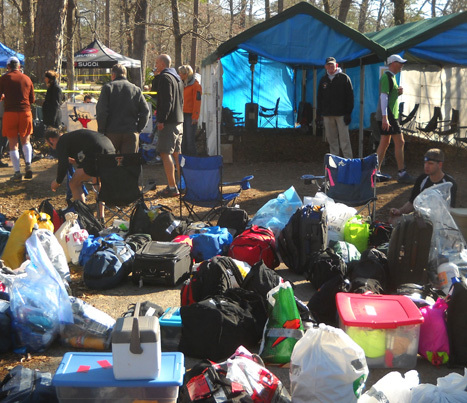 This was a great location for the pre- and post-race activities: packet pick-up, course briefing, bag drop, and dinner on Friday afternoon/evening and the 100-mile awards breakfast and bag retrieval on Sunday morning. RD Joe Prusatis stands ready to grab another runner's bag; there were many more boxes than that. 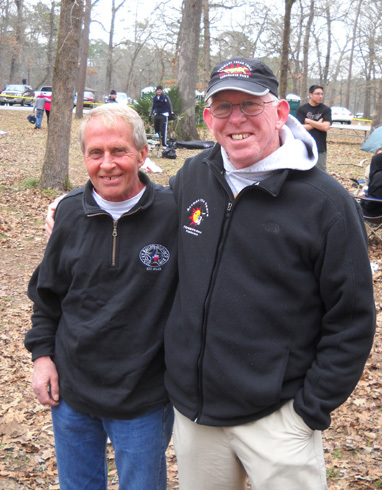 Although we were told by one of Joe's race managers on Thursday that he had plenty of help for packet pick-up, we could clearly see more assistance was needed when we arrived on scene about 4:30 PM Friday to socialize with friends who were coming for the race. Runners were lined up about thirty deep down the hallway while two fellas worked the computers as quickly as they could. They really needed more folks handing them the packets, especially after Joe had to begin the briefing. Jim and I volunteered for an hour to hunt for the packets (plastic bags with the runners' numbers on them, but not all in order) and helped distribute them to the runners so they could get into the adjacent dining room in time for the briefing. Fortunately, the entrants' jackets and shirts were already stuffed in the bags and all the volunteers had to give them separately was their timing chip. One of the nice things about working packet-pickup is seeing old friends and meeting new ones. We introduced ourselves to a couple folks whose names we recognized from the ultra list (Joe Judd and Shannon Farrar-Griefer) and quickly said hi to some others we already knew, like Nick and Jamil Coury, below (young, smiling men on right). That's about all we could manage at that time with the pace as frenetic as it was. Fortunately, we had other opportunities at meals and during/after the race to talk with many other friends from all over the country. 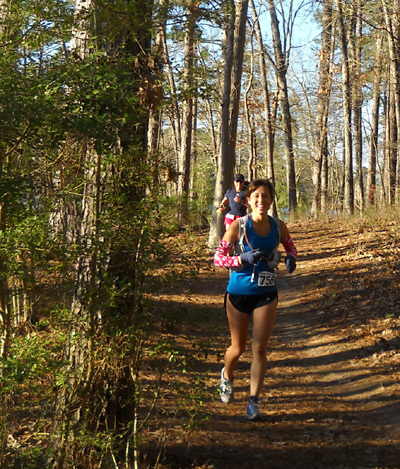 That's one of the neat thing about 100-milers -- we know a lot more of the runners than at shorter races. We enjoyed a nice conversation with Rolf Koford and his daughter Amelia during dinner. Rolf recognized us from this website. I love it when that happens! 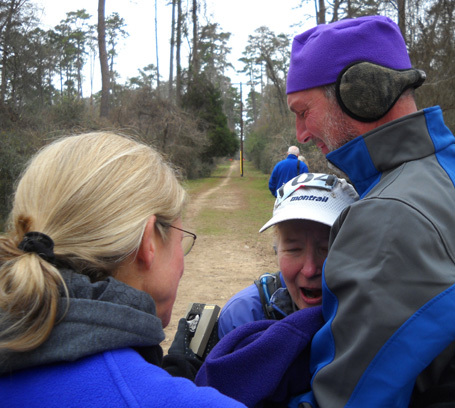 Something similar happened after the race, too, when Bob Lynes introduced himself to me and thanked me for the pictures on our website and Picasa site of the trails at McDowell Mountain Regional Park in Arizona. He said the photos were helpful to him when he was training to run the Javelina 100-mile race for the first time. One of my goals with this website has been to provide helpful information to readers about the races we've run and worked, the places we travel, and other things I think might be interesting or entertaining. Feedback like Rolf's and Bob's is priceless and gives me the incentive to keep on writing and taking pictures. Thank you, guys! Jim might say, "Don't encourage her!" He thinks I spend too much time working on the website but it's a hobby I love. I think Jim and I were up before some of the runners who were staying overnight in the park on race morning: 4:30 AM. Temps were in the low 40s at our camper. The sky was clear but it was fairly dark with about 40% of the moon shining. We left the camper at 5:15, walked to the start, and let course captain Henry Hobbs know we were present and accounted for. Then we struck off on the course. Our first job on race morning was to hang glow sticks in the first two miles of the course. 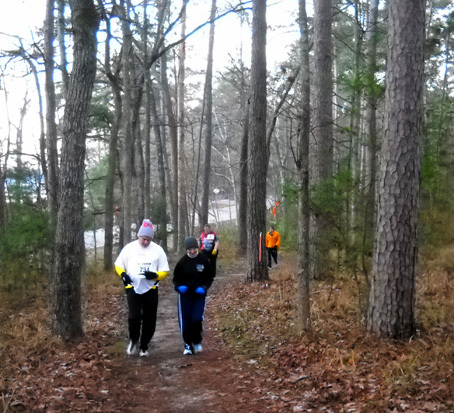 It was still fairly dark in the woods when the 100-milers began at 6 AM. Jim and I worked together for about a mile, then he finished the next section to the turn he would be monitoring. I went back to a critical turn about half a mile into the race to make sure the runners didn't get off-course in the dark. Other volunteers hung glow sticks beyond ours. At 6 AM 344 runners began the 100-mile race. It didn't take them long to reach my turn at about 4/10ths of a mile into the course. Although I greeted everyone and told them to take a left, I couldn't see their faces in the dark and they couldn't see mine. I did recognize a couple of them by their gait or voice, however. Even though most of the runners had no clue who I was, many of them said thanks for being out there so early. I really appreciated that. Jim came down to "my" turn for the 50-miler after the sun came up. 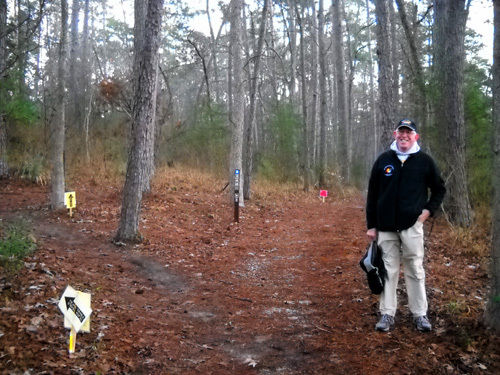 Jim had a similarly good time at his turn farther up the trail at the intersection of Dogwood and Prairie Branch. 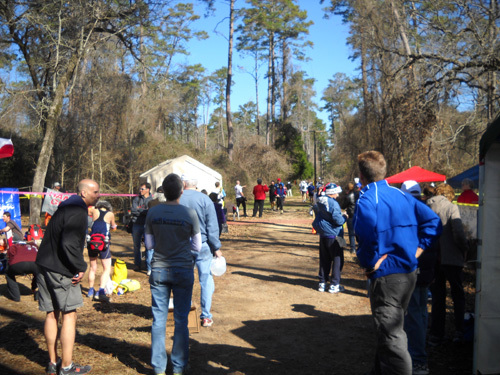 When I was reasonably certain the last runner had passed my turn at about 6:12, I walked back and forth to the start and over to the Nature Center aid station until 7 so I could keep warm. The runners should have been fine but just standing still was bone-chilling in the damp cold. 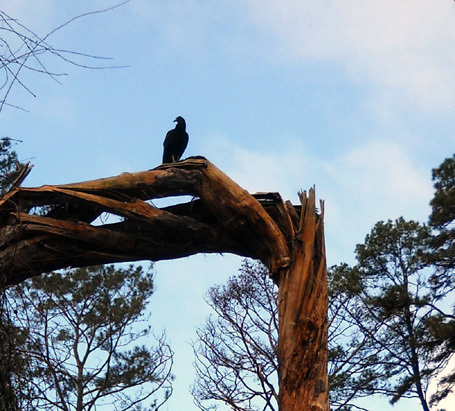 I thought about the vulture as I walked under his tree. I never heard later that the vulture got anyone, but I could be mistaken! Meanwhile, back to race morning . . .
Jim's intersection was closer to the campground than mine was. He went back to the camper, got both of us a mug of hot coffee, and brought some to me at my turn. That was a nice surprise! Since it was daylight now and his turn was clearly marked, he stayed at my intersection when the 50-milers came through. 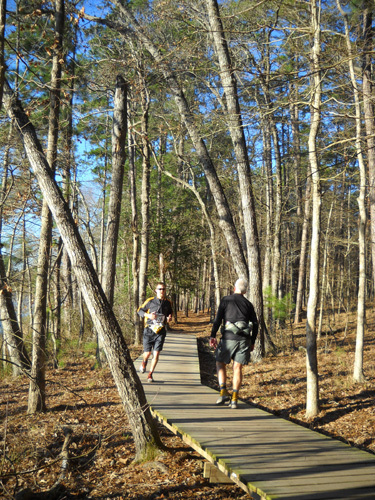 My turn on the Dogwood Trail was about fifty feet from the main park road runners take to the start. I couldn't believe how many cars passed by between 6 and 7 AM. It's a wonder they all found a place to park before the 50-mile race began at 7. Two hundred ninety-five runners began that race, for a total of 640 runners starting the two races. Whew! That's one of the larger ultra events in this country. Despite the "crowd," RD Joe says he got no complaints about the trails being too crowded. It helps that the starts were staggered and the courses for the two races aren't completely identical. 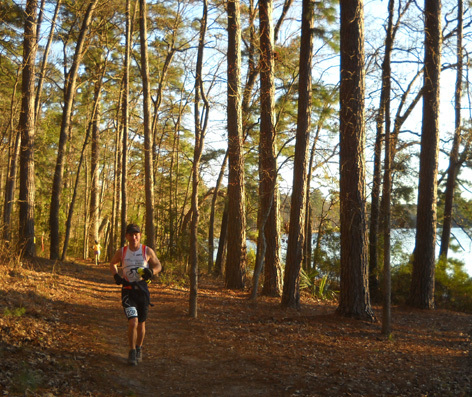 Hundred-milers run five 20-mile "loops" and 50-milers do three 16.7-mile loops. Jim and I had more fun working the turn during the first loop of the 50-miler than the 100-miler because it was light enough to see everyone's faces when the shorter race began. Too bad we didn't know as many of them as runners in the 100-miler. On subsequent loops runners were on their own at those turns. Although the course has many twists and turns it is always very well marked with ribbons, arrows, signs plus glow sticks at night. It's rare for a Rocky runner to get lost, even in the dark. From what I hear, all of Joe's races are like this. 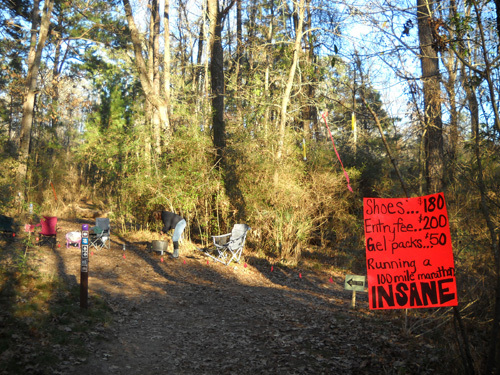 Incoming runners' view of the Dogwood (start/finish/turnaround) aid station at 7:24 AM Saturday. 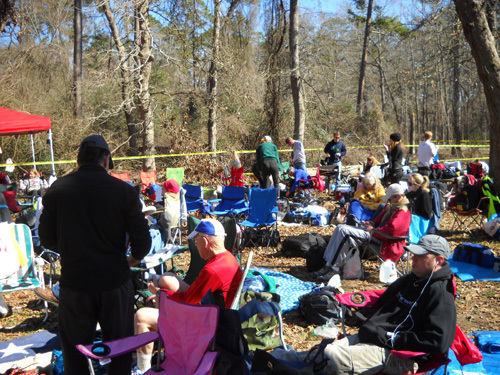 With so many runners in this year's event, everyone at the start/finish/turnaround area was prepared for the busiest hours to be between about 9:15 AM and 12:45 PM, when the majority of runners would be returning from their first 16.7- or 20-mile loop. Later on, they'd be more spread out. The start/finish area was a beehive of activity throughout the race. It was the site of the largest aid station, the most drop bags, and the most crucial time recording. The runners all wore chips on their ankles to record their times at this turnaround but numbers were also recorded by hand as a back up. Results were posted to the website fairly frequently. Updates worked great during the day on Saturday but broke down during the night. We were able to see how friends were doing when we checked our computers in the camper before going to bed; however, results weren't updated when we got up Sunday morning. Final results and runners' splits are apparently accurate on the website now. One of Jim's jobs during the morning was to greet runners as they approached the timing table and mat at the start/finish turn-around at the end of their first loop. He reminded them to have their numbers clearly visible so the timers could record them. 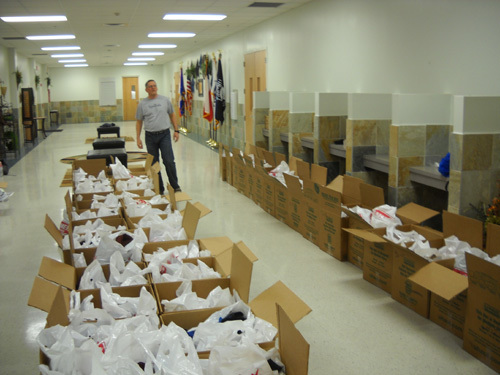 He also helped runners fill their water bottles and bladders and retrieved drop bags. Jim (in tan pants) stands ready to help runners in the aid station. My main job from 9:15-12:45 was in the very busy drop bag area. Before we got there other volunteers had already organized all the runners' drop bags by race and number. Ones without names or numbers caused problems for us, of course. They were all in the back, the pile we went to if we couldn't find the bag in its correct order. There was quite a variety of bags and boxes, some quite heavy. A few runners came into the bag area to get their own bags but while it was busy on Saturday morning it worked best (for the volunteers, at least!) when runners stayed on the course and told one of the volunteers at the front of the drop bag area their number. That volunteer would shout out the number to those of us farther back in the bag area. We'd locate the bag and hand (or throw) it to the "front man." There were six to eight of us working the bags at any one time in the morning as the runners came in steadily. 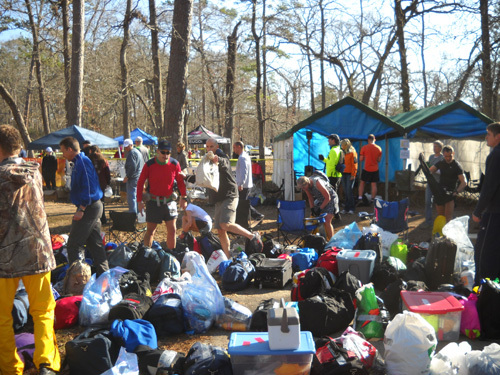 Some of the runners put their bags in other areas where they had crews or tables. That may have been more efficient for them throughout the race, although there wasn't room for everyone to put their bags close to the course. One of the areas where runners could put their drop bags and crews could wait. The drop bags stayed in good order while so many of us were in attendance. When Jim went back to work the drop bag area from about 4-6 PM, it was no longer as well organized as it was in the morning. 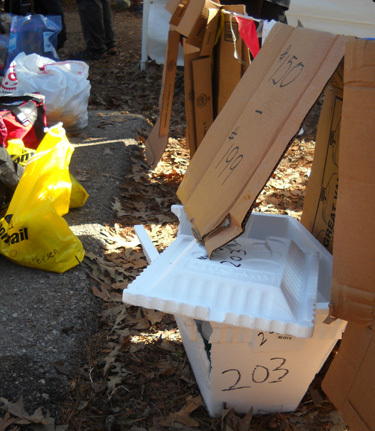 There were fewer volunteers to retrieve or replace the bags during the afternoon and runners just left them helter-skelter. Only Jim and one other guy were working the bags before suppertime. Jim wasn't even scheduled to work then; he just wanted to see friends come into the aid station and figured he may as well help out since only one other person was trying to work the bag area. The aid station captain was gone and he couldn't find anyone in charge. Although some of the 50-milers were done and gone, there were so many bags in disorder that Jim simply gave up in frustration and came back to the camper for supper. Someone's crew at Prairie Branch Trail just doesn't get it . . . While he was at the start/finish, I walked down the Prairie Branch Trail along the lake to various points to take photos of runners as they ran this two-way section of trail. The light was beautiful in the late afternoon as the sun was setting. I don't have a list of runners' numbers; anyone know who these folks are?? 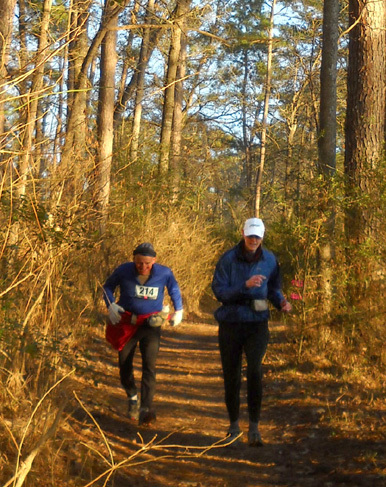 The fastest 50-milers were already done but most were still out on the course. I enjoyed seeing friends and encouraging everyone I saw. 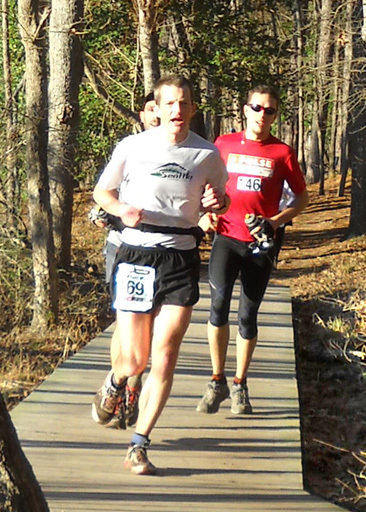 Grant Holdaway (L) on his third loop of the 100-miler, paced by Anne Watts. After all the walking, standing, and handling drop bags Jim and I both slept well that night! We were far enough away from the course and the start/finish area that we didn't hear any race noise during the night. Jim walks toward the finish mat (timing tent is on the right) two hours before the end of the race. Only Joyce Prusaitis, the timers, a few other volunteers, recent finishers, and families/crews of runners still on the course were left. Jean-Jacques d'Aquin, who recently turned 70, won his age group in 28:34.
as Val Aistars looks on. first 100-mile finish after several attempts at more difficult races like Hardrock and Plain. Val Aistars (L) watches his wife Juli approach the finish line. Juli's time was 29:23. 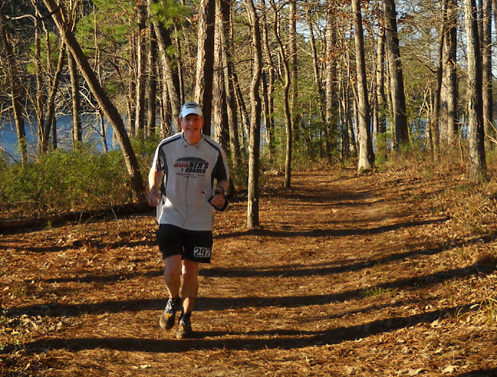 50th birthday by running his first 50-miler on Saturday. Lynnor also ran 50 miles. from reading their posts to the ultra list the last few years. 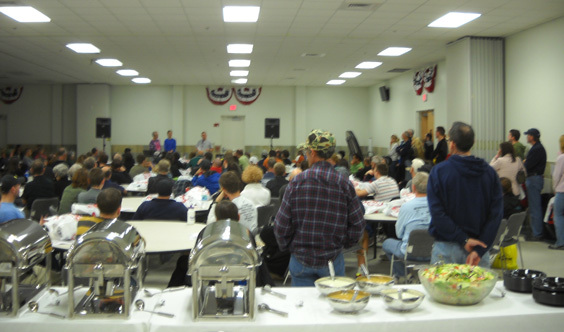 We left in time to get to the post-race brunch at the veterans' building in Huntsville, about a 15-mile drive from the finish area, but we missed the awards presentation. 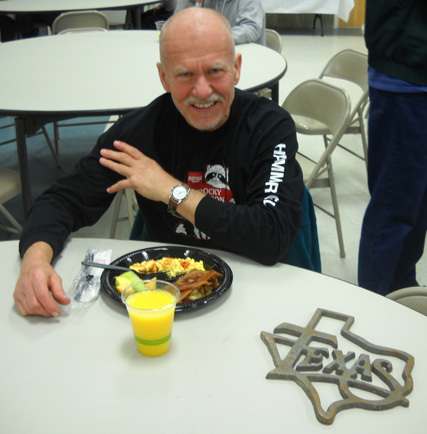 Joe found more great metal sculpture awards for this race, similar to those at Bandera. 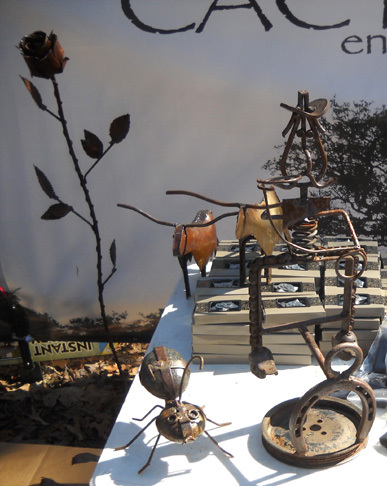 I took this photo of some of the whimsical and artistic awards that he displayed at the finish area. 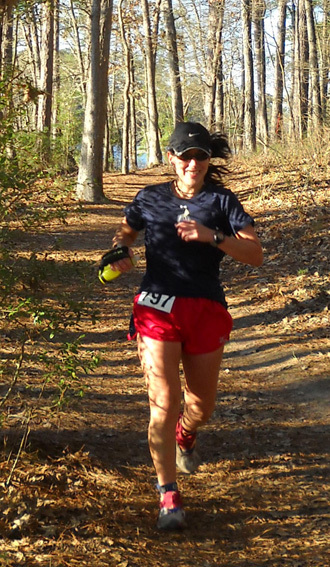 They may be for the 50-miler; the awards for that race were presented at the park on Saturday afternoon. Nick and Jamil were equally pleased with their 100-mile times. They each took about six hours off their previous bests, finishing together in 17:09, which put them in the top ten overall. We recently learned that Jamil and his family have formed a new race management business in the Phoenix area called Aravaipa Running. This was our first chance to talk to Jamil in person about the series of eight ultras he will be directing, including (ta, da!!) Across the Years 72-, 48-, and 24-Hour Runs!!! We were thrilled when we first heard that the Courys would be resurrecting the race at the end of this year at Nardini Manor -- with the blessings of Rodger Wrublik, who owns the property, and RD Paul Bonnet. Check the website above for the complete list of Aravaipa's ultra races and dates. Three of the events, including Javelina 100, are at McDowell Mountain Regional Park near Phoenix. Three others are in the Phoenix metro area or nearby Prescott, AZ. Two are in Silverton, CO, where Rodger lives most of the year. One of the Silverton events, to be held in September, is a 1,000-mile challenge on Kendall Mountain. No, that's not a typo! Check it out. Jim (R) and another volunteer are almost done with the tables. 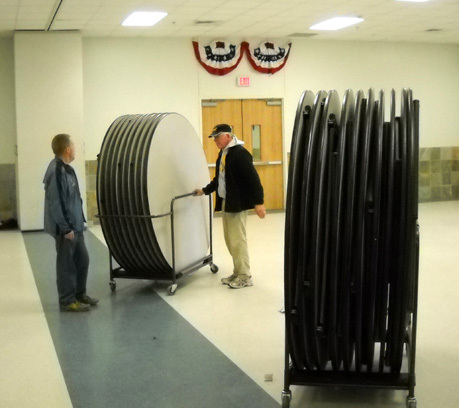 Our final volunteer effort was unplanned: helping to stack all the tables and several hundred chairs and wheel them into a room behind the dining area. It was obvious Joe needed help so several of us stayed until the job was done. That added up to eight to nine hours each that Jim and I worked during the race. The hours were spread out over three days and four different periods of time, making it easier on us than several days of work at Bandera. Check the Rocky website for finishing times in both races and a synopsis of the race from RD Joe Prusaitis. 217 finishers under 30 hours, including 91 under 24 hours (that's what I mean about a fast course) = 63% finish rate, the lowest in the race's history. Joe attributes that to the cold, damp night. 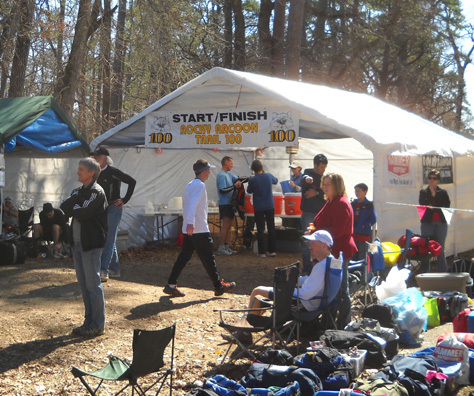 The race also attracts quite a few first-time 100-milers, who are less likely to finish than 100-mile veterans. Hans-Dieter Weisshaar, who will be 70 later this year, finished five minutes later in 28:39; Hans has finished well over 100 hundred-milers now (he's probably up to 125 by now -- anyone know?) His photo is above. Kathie Lang, 60, finished in 29:01 and was first in the F60+ age group; the only other woman over 60 who finished was Vicki Griffiths, 66, in 29:50. Kathie's photo is above. It was great to see so many of our friends at the race and to meet new ones. It's always sad when they all leave. HSP campground after everyone left on race weekend . . .
After camping at Huntsville State Park the last 17 days, we'll be leaving tomorrow, too. 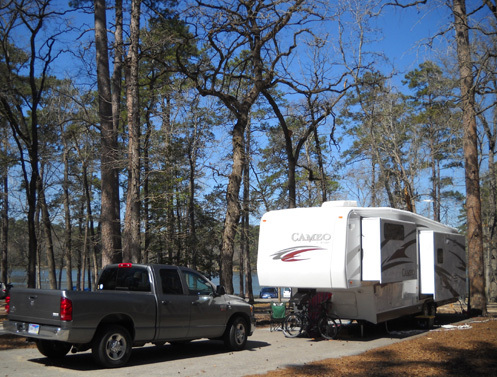 But we won't be going far: only about 50 miles east to Lake Livingston, another Texas state park. 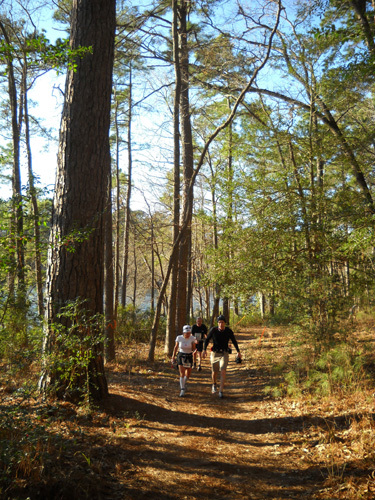 We'll be back at Huntsville SP on March 15 for the remainder of February.